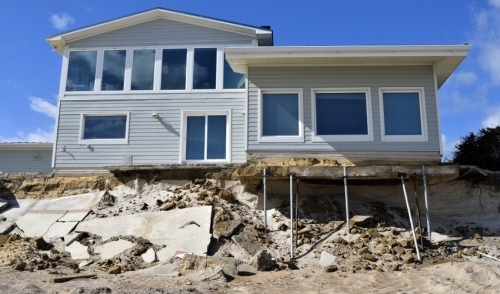 Structural survivors of a disaster can teach building scientists a lot about how to build more homes that will stay standing. In a large-scale natural disaster, the casualties pile up and the survivors are few. But the structures that survive teach lessons. Case in point: When Hurricane Ike struck Texas in 2008, the killer storm wreaked havoc on the Bolivar Peninsula, across from Galveston Island, wiping out almost every house on the peninsula. But 10 homes in the tiny Bolivar town of Gilchrist, built to the standards of the Insurance Institute for Business & Home Safety (IBHS) “Fortified” program, survived with barely a scratch (a couple of houses did lose outdoor access staircases). Locals call the homes the “bird houses,” perhaps because to meet the local elevation requirements and the IBHS program’s freeboard, they perch at a dizzying height above the beach. But there they stand—proof that elevation works. In California in 2007, a subdivision near San Diego provided an early proof of concept for the state’s tough new WUI code, then about to take effect. The Bridges, a Lennar Homes luxury development in Rancho Santa Fe, was built with all the elements of resilience: well-­tended “defensible space” around every house, screened vents to hold out flying embers, non-combustible exterior materials, and dual-glazed windows. The buildings also had fire sprinklers—a last line of defense that did get called into play on one house, where a piece of particleboard left outside against a door was ignited by embers, allowing fire to get through the door into a garage, which activated a sprinkler head. It was the exception that proved the rule: the rest of the houses were untouched by fire, even as the flames came within 200 yards. Four other similar housing areas also escaped unscathed, even as 61 other houses in town burned, along with hundreds more countywide.